A time-calibrated phylogenetic tree for Proteaceae based on sequences for 343 taxa, representing 339 species (337 species plus two subspecies, ~21% of total species), representing 75 out of the 82 recognized genera (91%), and 4 outgroup species from related families (Nelumbonaceae, Platanaceae, Buxaceae and Sabiaceae) for five chloroplast markers (atpB, matK, rbcL, rpl16 intron and trnL-trnF) downloaded from GenBank (GenBank accession numbers are provided in Onstein et al. electronic supplementary material, table S3). Details on the phylogenetic approach, fossils and calibration are given in Onstein et al. Proteaceae alignment based on sequences for 343 taxa, representing 339 species (337 species plus two subspecies, ~21% of total species), representing 75 out of the 82 recognized genera (91%), and 4 outgroup species from related families (Nelumbonaceae, Platanaceae, Buxaceae and Sabiaceae) for five chloroplast markers (atpB, matK, rbcL, rpl16 intron and trnL-trnF). For details see Onstein et al. Average leaf functional traits, diversification rates (based on clade-stem ages) and climatic niche variables for Proteaceae species studied in Onstein et al. 2016 GEB (same as Appendix S2). The excel file also includes a sheet with the raw data for all Proteaceae species currently accepted, and a sheet for the results of the herbarium experiment (i.e. changes in average leaf traits from fresh to herbarium) as described in Onstein et al. 2016. Aim: Ecologically driven diversification can create spectacular diversity in both species numbers and form. However, the prediction that the match between intrinsic (e.g. functional trait) and extrinsic (e.g. climatic niche) variables may lead to evolutionary radiation has not been critically tested. 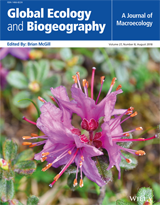 Here, we test this hypothesis in the Southern Hemisphere plant family Proteaceae, which shows a spectacular diversity in open mediterranean shrublands in the Southwest Australian Floristic Region (SWAFR) and the Cape Floristic Region (CFR). Species in the Proteaceae family occupy habitats ranging from tropical rain forests to deserts and are remarkably variable in leaf morphology. Location: Southern Hemisphere. Methods: We built a phylogenetic tree for 337 Proteaceae species (21% of the total), representing all main clades, climatic tolerances and morphologies, and collected leaf functional traits (leaf area, sclerophylly, leaf shape) for 261 species and climatic niche data for 1645 species. Phylogenetic generalized least squares regression and quantitative-trait evolutionary model testing were used to investigate the evolutionary pathways of traits and climatic niches, and their effect on diversification rates. Results: We found that divergent selection may have caused lineages in open vegetation types to evolve towards trait and climatic niche optima distinct from those in closed forests. Furthermore, we show that the interaction between open habitats, dry, warm and/or mediterranean climates, and small, sclerophyllous, toothed leaves increases net diversification rates in Proteaceae. Main conclusions: Our results suggest that the evolution of specific leaf adaptations may have allowed Proteaceae to adapt to variable climatic niches and diversify extensively in open ecosystems such as those in the CFR and SWAFR. This match between morphology and environment may therefore more generally lead to evolutionary radiation.